The parish of Grimston, in the west of the county, is long and thin. The villages of Grimston and Pott Row, in the centre of the parish, are flanked by Grimston Heath in the east of the parish, and Grimston Warren in the west. Grimston comes from a combination of an Old Scandinavian personal name ‘Grimr’, and the Old English ‘tun’ meaning ‘farmstead or estate’. There is evidence for early occupation. Prehistoric flints (NHER 2326, 3331, 3590, 15632, 24938 and 34757), a prehistoric quern (NHER 17004), and prehistoric pot boilers sites (NHER 2325, 2327 and 3590) have been found. An Early Neolithic leaf arrowhead (NHER 39964), Neolithic axeheads (NHER 2324, 14067, 34912 and 36581) and Neolithic scrapers (NHER 13963, 14010 and 29200) have also been found scattered throughout the parish. A possible Neolithic flint mineshaft on Grimston Heath (NHER 2338) was recorded in the 19th century. This feature is close to the Neolithic flint mines in Great Massingham. Beaker and Bronze Age pottery (NHER 2330, 2333 and 2335) were found on Grimston Heath in the 1930s. A Bronze Age dagger (NHER 2334), a palstave (NHER 3574) and spearheads (NHER 31196 and 34909) have been found in the parish. Several Bronze Age round barrows (NHER 2330, 2331 and 2332) survive as earthworks at Stonepit Hills, in the east of the parish. The cropmarks of ring ditches (NHER 2343, 3601, 15405 and 19282), probably the remains of Bronze Age barrows, are visible on aerial photographs. The only evidence of Iron Age occupation in the parish are fragments of Iron Age pottery (NHER 2336 and 19965) and gold and silver Iron Age coins (NHER 3602). 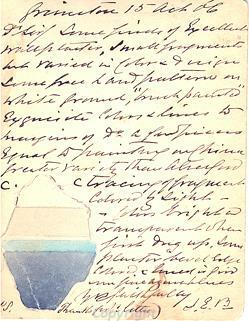 A postcard written by J.E.B. in 1906 describing the discovery of painted wall plaster at Grimston villa. 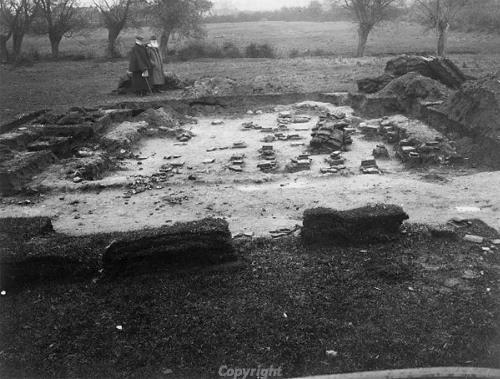 The remains of a substantial Roman villa (NHER 3575) were discovered in a field next to Watery Lane in the 19th century. The villa was excavated in the early 20th century, revealing the plan of the villa as well as tesserae, painted wall-plaster and other Roman finds. The remains of another Roman building (NHER 3579) have been found in the field adjacent to the villa. The building was probably associated with the villa, and Roman coins and metal finds have been found on the site, which is locally reputed to be a Roman temple. Other possible Roman buildings (NHER 21780, 29404 and 19110) have been found to the south of Watery Lane. In the far south of the parish, and stretching into Gayton parish, is the site of a Roman settlement known as Well Hall (NHER 3592). Roman pottery (NHER 2327, 3599, 13800, 21712, 21713 and 30967), Roman coins (NHER 3599, 16827, 19965, 32100 and 39880), Roman brooches (NHER 3586, 3599, 3602, 15479, 37204 and 41901), a Roman brooch mould (NHER 43198), a Roman bracelet (NHER 30967) and other Roman metal finds (NHER 3602 and 19965) have been found by metal detectorists throughout the parish. Early Saxon pottery, grave goods and human remains have been found on the site of an Early Saxon inhumation cemetery (NHER 3573) near the Bell Inn since the 1920s. An excavation carried out by the Norfolk Archaeological Unit in the 1970s revealed more burials on the site. A second Early Saxon inhumation cemetery (NHER 43198) has been revealed through metal detecting. Part of an Early Saxon glass vessel (NHER 2337) was found on Grimston Heath in the 1930s. Early Saxon brooches (NHER 3592, 13800 and 19965), Early Saxon pottery (NHER 19965) and an Early/Middle Saxon buckle (NHER 39719) have been found in the parish. A Middle Saxon pin (NHER 3602) a stylus (NHER 29404), a brooch (NHER 32100) and Middle Saxon pottery (NHER 29544 and 30967) have also been found. Grimston is recorded in the Domesday Book as a relatively wealthy and well populated settlement. The land was held by the Bishop of Bayeux, William of Warenne, Roger Bigot and Berner the Crossbowman. Before the Conquest the land had been held by Archbishop Stigand, and two free women named Aelfeva and Wulfum. During the Late Saxon period Grimston was one of a number of places, including Fransham and Bircham, where a rural pottery industry producing Thetford ware grew up in the early 11th century. Grimston continued to be an important pottery production site into the 12th century, producing Early Medieval ware. The earliest evidence for pottery production in the parish comes from the fields in between Grimston and Pott Row, where J. Nicholls excavated an early 12th century pottery kiln (NHER 11789). Evidence for Late Saxon pottery production has been discovered at several sites within the parish (NHER 3580, 3581 and 3584). All of these sites continued to produce pottery in the medieval period. In Pott Row a Late Saxon ditch and post hole structure (NHER 1016) were excavated by the Norfolk Archaeological Unit in the 1970s. Excavations in the 1980s and in 1992 on Vong Lane (NHER 24054) revealed Late Saxon and medieval buildings, ditches and pits, as well as pottery kilns. The site developed alongside a lane from the 12th century onwards. A number of Late Saxon metal finds (NHER 1016, 3592, 3599, 3602, 11790, 13800, 15663, 29404, 34911 and 35686) have been found by metal detecting. The pottery industry reached its peak in the 13th and 14th centuries, and Grimston pottery has been found as far afield as Sweden and Norway. However, there is no documentary evidence for the medieval pottery industry in the parish, therefore all our knowledge about medieval Grimston is based almost purely on archaeological evidence. A number of medieval pottery production sites (NHER 3582, 3586, 3588, 22840, 22954 and 24054) have been discovered through fieldwalking and excavation. The remains of medieval buildings and kilns have been found on one site (NHER 11789). During the 15th century the pottery industry in Grimston began to decline, and it has disappeared by the 16th century. St Botolph’s Church (NHER 3608) dates mainly from the 13th century, but contains some evidence of Norman work and reused Roman bricks and tiles. The church has a large 15th century west tower. Several medieval inhumations (NHER 9871) were found in the garden of Rose Cottage in the 1970s. It has been suggested that the burials may be part of a medieval churchyard. The medieval deserted settlement of Wyveling (NHER 3324) is in the west of the parish, and was a very isolated settlement during the medieval period. The earthworks of the village are clearly visible on the site. Excavations on the site in the 1960s revealed a probable medieval charcoal burning site, which was probably associated with the pottery industry. The site of another medieval settlement (NHER 19619), north of the modern village of Grimston, was revealed during an excavation in 1983. A third deserted medieval settlement (NHER 19915) is near Manor Farm. The earthworks of medieval house platforms and fishponds were destroyed by ploughing in the 1980s. A medieval moat, trackways and other associated features (NHER 3602), a second medieval moat with a possible outer enclosure (NHER 11790) and a medieval building (NHER 3579) are all visible as cropmark on aerial photographs. The cropmarks of several ditched enclosures to the north of Pott Row have been interpreted as the site of a medieval manor (NHER 18106). Another medieval manorial site (NHER 24429) has been identified to the east of the village of Grimston. White House Farmhouse (NHER 33847) is a 16th century timber framed building with an original garderobe chute. The Old Rectory (NHER 3603) is a 19th century building that contains some elements of a 17th century building. The house is surrounded by a medieval moat, and various earthworks within the moat are probably post medieval garden features. Elder Farmhouse (NHER 33846) is a carstone and brick house dating to the early 17th century, which was extended in the late 17th century. Church Farm (NHER 33848) is a 17th century house with 18th century alterations. A windmill (NHER 14991) is depicted on a late 17th century map. A circular field and the miller’s cottage are now the only sign of the mill, which stood to the west of Pott Row. Gay and Wilson’s Tramway (NHER 13756) took sand from Grimston Warren to Bawsey. The tramway closed in 1905. During an excavation in the 1970s the base of a World War Two pillbox (NHER 13799) was found next to the main road through Pott Row. To the northeast of Warren Farm is a brick structure (NHER 15295) used as a beacon during World War Two. The beacon was probably connected with nearby bomb targets (NHER 12833). A World War Two searchlight battery (NHER 21713) is visible on aerial photographs taken in 1946. Sarah Spooner (NLA), 26 January 2006.